Dismantling the myth of the ‘Rainbow Nation’ through performance art. Acclaimed South African visual and performance artist Athi-Patra Ruga took his skills to the streets of the Big Apple for Performa 17 Biennale in November. 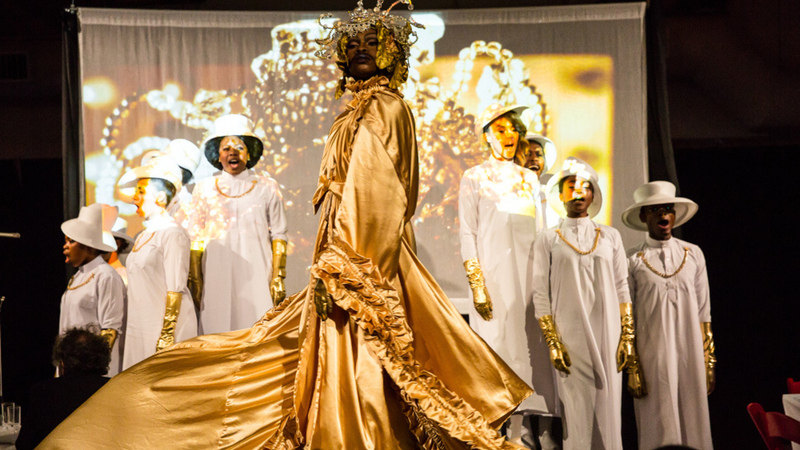 In a room filled with museum curators, writers, and artists as prolific as Cindy Sherman, Ruga – flanked by a jazz band and a chorus of singers dressed in white and gold – presented his performance piece, Over the Rainbow to an awestruck New York audience. Founded by RoseLee Goldberg in 2004, Performa is touted as the leading organisation in performance art. It explores the role of live performance in twentieth-century art. Even though it was hosted in honour of iconic Nigerian curator, museum director and writer Okwui Enwezor, Ruga emerged as the star of this year’s annual gala. Resplendent in a champagne-coloured, billowy robe, Ruga appeared before his audience as The Versatile Queen Ivy, a character he developed for the piece. He has unveiled a number of these avatars throughout his career most of whom are parodies of the feminine construct as seen through the eyes and laws of men. Ruga’s trademark performances are an exploration of the identity politics that he and many young black South Africans have been grappling with for decades. By mixing this complex trauma with vibrant and enchanting visuals, Over The Rainbow became as much of a visual spectacle and social commentary as Ruga’s earlier works. His visuals are subversive of South African stereotypes. In a display of unity and forgiveness, Archbishop Desmond Tutu nicknamed our post-apartheid democracy “The Rainbow Nation.” “But, in the space of 22 years, the ‘happy family’ picture that we portrayed to the world is fading,’” Ruga explained to The New York Times. In a country once defined by the division of black and white, The Rainbow Nation is long felt to be a term bestowed to us in lieu of actual transformation. Ruga’s Over the Rainbow – a riff on this concept – serves as an expression of the destruction of a myth that rendered many South Africans complacent following 1994. In the midst of continuing student protests, political corruption and calls for the decolonisation of many aspects of South African society, the Rainbow Nation concept appears to be coming apart at the seams. Now that the foundations on which the new South Africa was built are being shaken, opportunities for honest artistic reflection abound, something which Ruga is taking full advantage of. In the spirit of African artists becoming a regular fixture within the international art scene, as opposed to being quickly imported to placate calls for diversity, Ruga brought along some of his equally talented artist friends who served as his collaborators on the piece. Producer Angel-HO aka Angelo Valerio provided the sound design while rapper Dope Saint Jude (Real name Catherine Pretorius) provided the music. Award-winning vocalist Vuyo Sotashe led Ruga’s white and gold clad choir, placing even more attention on African and diaspora art.